I swear, Memebox has the most perfect timing for the Memebox Ambassador boxes! They kindly sent me some new skincare to test out and it's all about roses and hydration. I normally have dry/dehydrated skin but fall and winter really makes my skin look and feel more dry and dull. The box Memebox sent me included the Bonvivant Botanical Pure Rose Cleansing Foam*, Pure Rose Toner*, and Rose Mask Packs*. If you're interested in all three, there's also a set you can purchase here from the Memebox website for $30 and it even includes a cute bear head band! You can also buy them separately and I'll include those links in the reviews! The Bonvivant Botanical Pure Rose Cleansing Foam* contains Damask Rose Water that is supposed to hydrate the skin without making it feel stripped. You can find it here on Memebox for $10. The cleansing foam comes out like a cream and lathers up to create a dense foam. I'm actually pleasantly surprised at how nice it foamed up because even adding some more water, the foam would keep going and even refoam up the more I massaged it into my skin. It did a really great job at removing my makeup, but I still found slight traces of mascara on my lashes. I do use waterproof mascaras though and usually see traces of mascara until I double cleanse. After washing off the cleansing foam, my face does look nice but unfortunately, this cleansing foam did make my face feel a bit dry in that "squeaky clean" kind of way. Personally, I'm going to switch back to using cleansing oils or balms because those kind of cleansers work better for my dry skin. The Bonvivant Botanical Real Rose Oil Toner* includes Damask Rose Water like the cleansing foam and Damask Rose Oil, which also helps to hydrate the skin. According to Bonvivant, this toner also includes Pantehnol and Allantoin to sooth and smooth irritated skin. You can purchase this separately for $14 here. 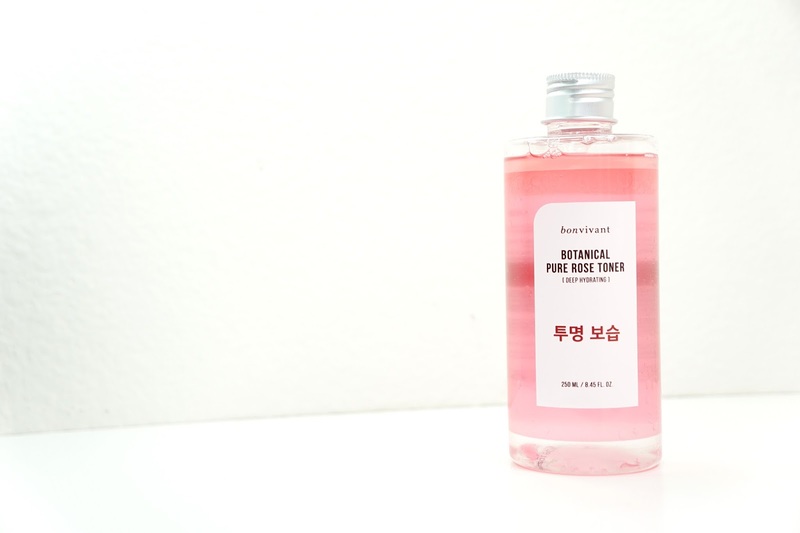 This toner is dual phased with the oil being on top and so it's recommend to give it a good shake before soaking a cotton pad and applying it on the face. If your skin is feeling extra dry, you can also use the oil by itself by just skipping the shakes. I prefer it mixed though since there's more liquid than oil and I don't want the oil to run out. Unlike the cleanser, this toner made a huge difference even with the first use. The toner also worked amazingly with and without the cleansing foam and sheet masks. While the cleansing foam did make my skin feel a bit stripped, the toner would put back all the moisture (and even more!) into my skin. My skin also doesn't feel oily after using the toner and instead looks perfect and feels soothed and soft. 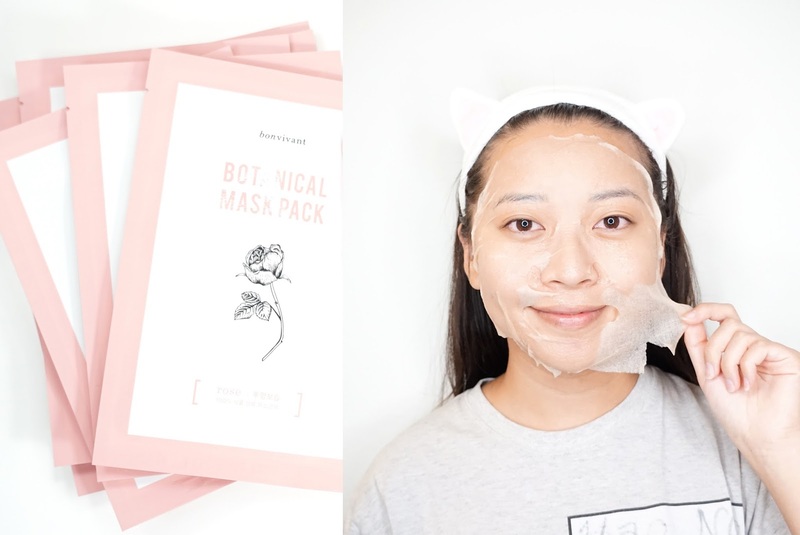 I don't know if I've mentioned it on my blog, but I've definitely been singing praises for the Bonvivant sheet masks from their Pure Mask Pack range. 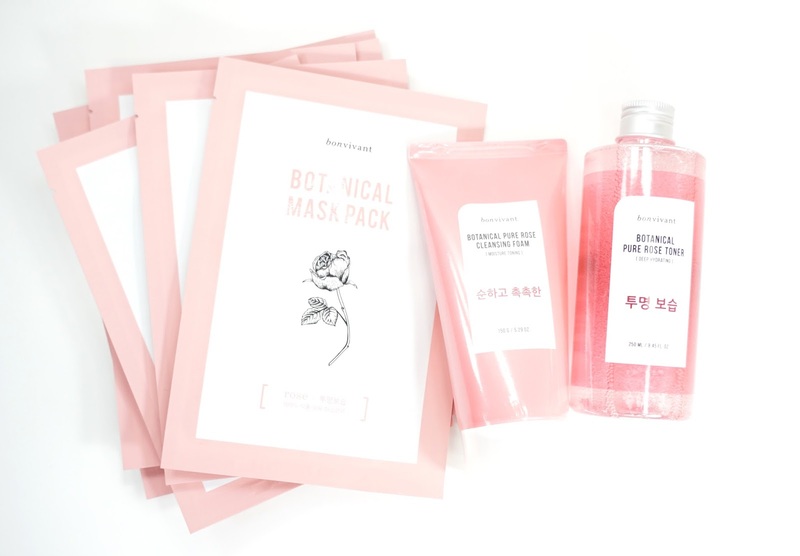 The Bonvivant Botanical Rose Mask Pack* is from one of their other masks range and it is also slightly more expensive. Each Mask Pack retails for $3 and the Rose version can be found here. It's made out of Botanical fiber and has Botanical juice instead of water as well to give better benefits. The color of the sheet is also different from normal because of the rose fibers that are also built into the mask. In terms of fit, I do like the Rose Mask Packs more than the regular line of sheet masks. The eye and mouth holes are bigger and so I wasn't worried about anything getting into my eyes our mouth. I do feel like the regular masks have more essence, but the Rose Mask Pack still gives me the same amount of moisture. For my skin type, these sheet masks were also a huge hit. My skin also looked and felt better after the first use. Final thoughts: I can take or leave the Real Rose Cleansing Foam, but I will absolutely keep using and repurchasing the Real Rose Oil Toner and Rose Mask Pack. The cleansing foam didn't do much, but I saw almost immediate results from the toner and sheet mask. I even woke up to brighter, smoother, and more moisturized skin when I used these products. Honestly, I'm quite lazy with skincare reviews or even general posts but I was so excited to share my thoughts on the toner and sheet mask right away. I highly recommend checking those two products out and if you're more oily than I am, the cleansing foam might also be a good choice. *Memebox sent me these items for free as PR samples. All thoughts are my own and 100% honest.